The Hazelnut Inn worksite was very busy today. Electricians were pulling wire through conduits and installing the electrical panel. The carpenters were busy building the temporary shoring for the suspended slab. Today was also the day to begin backfilling the foundation. Filling the upper garden of the North Star suite was the toughest challenge. We had stacked a huge pile of sand inside before we began the forming but it didn't go far when we levelled it out. The walls are nine feet tall and access is difficult to say the least. 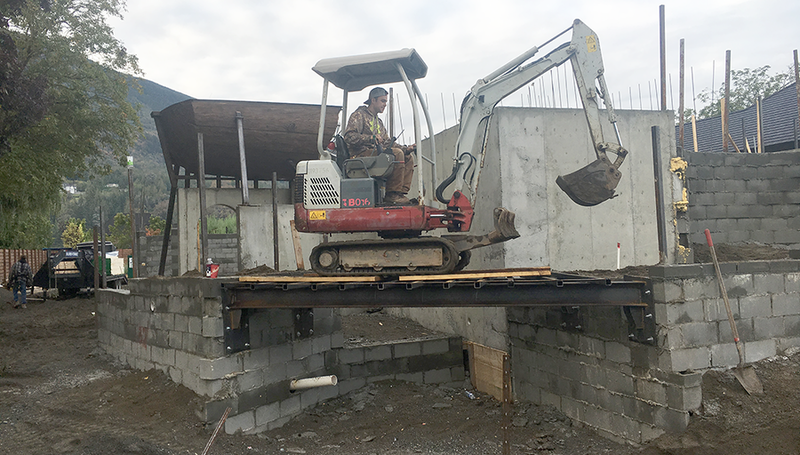 The solution was to put a small excavator inside the concrete box and have it spread the sand inside followed by a plate packer. The sand is dropped over the wall by a giant excavator. The first job was to get the small excavator inside the giant concrete box. It was time to test the welded steel bridge which we built last week… and it passed in brilliant style. Once inside the operators filled and packed layer after layer of sand. By tomorrow the crew will be finished and ready to make the trip back over the bridge one last time.